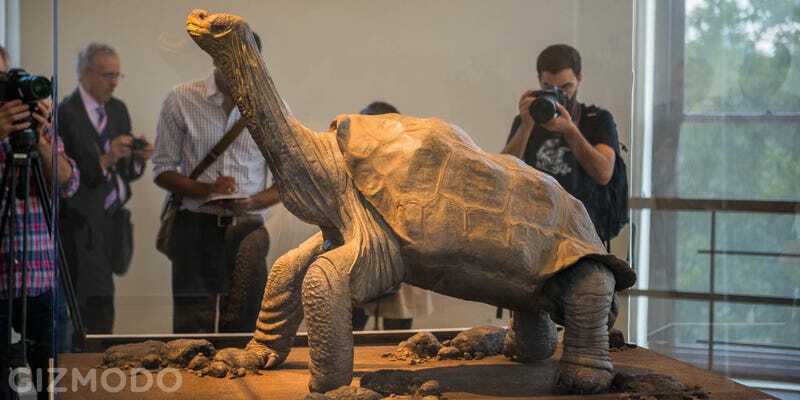 Yesterday the American Museum of Natural History took the wraps off its newest main attraction: Lonesome George. Lonesome George, the world-famous giant tortoise native to the Galapagos. He passed on in 2012 of natural causes. This set in motion the process to preserve George through the most complex and intricate taxidermy ever attempted—from a species of one. Making a individual animal's likeness, such as a pet, is usually avoided in the taxidermy trade. Once an animal is recreated they almost never look like how they once did to the people who were close to it in life, however true to the species they were. This made George an especially daunting task because he was one of the most well-known animals of all time. The first step was to position George and make a framework of him. This way Dante could create a sculpture accurate to his posture and size later on. The next step was to skin George and remove his shell. After the sculpture—built around the original shell—was finished, the skin was put back on. Dante then restored coloration to the shell and skin, based on images and research into George's habitat soil and vegetation samples. Stains from the vegetation in his habitat were painted onto his beak and soil coloration applied to his feet. This left the most challenging aspect for last: Lonesome George's eyes. No one had actually had discovered the exact eye color of a tortoise like George before. Yes, photos had been taken of him several times, but never close enough to reveal the true color of his seemingly beady black eyes. The team poured through countless photos looking for any insight. Eventually they visited a controlled tortoise habitat where the handlers helped get an incredibly up close macro shot of an eye of a close relatives to Lonesome George. With that straightened out, they sent out for a custom pair or glass eyes for a giant Pinta Island tortoise. The only of its kind. You can see George on display at the American Museum of Natural History in New York from today through January 4th. Then he'll be on display back home in Ecuador. George was preserved as part of an effort to bring awareness to man's power to destroy and save ecosystems. Because of an unnatural introduction of goats to the Galapagos, the tortoises had to compete for food. Goats have now been eradicated from the islands, but man's impact on habitats throughout the world isn't going anywhere.